Southampton-headquartered ship repairer and marine engineering services provider SMS has completed its first ever major high speed craft (HSC) refit in France. SMS last week docked the HSC Condor Rapide in Cherbourg on the Port Normands Associe’s (PNA) ship lift. SMS, over a week period, undertook the docking on the Rolls Royce syncrolift in the Port of Cherbourg. The lift is 90m x 32m and offers a 3000T lift capacity. Located just 75 miles from the Solent, it’s more effective solution for Solent centric operators than the ship repair yards in the North East and South West. Chris Norman, Managing Director of SMS, said: “This project will hopefully be the first of many. “It’s a great example of the type of turn-key solution that we specialise in at SMS. “Condor Ferries has long been a customer of SMS and now, with the unique relationships that we’ve got in France, we intend to put more and more business into Cherbourg and onto the ship lift. “The facility is perfect. We’re masters of our own destiny here in France and the proximity of the lift to the Solent region gives us a viable solution for not only Condor Ferries but also the likes of Brittany Ferries, Wightlink and Red Funnel. Chris added: “Since concluding our last acquisition in December the company has focused somewhat on high speed craft and commercial tonnage. “We’ve had some great wins with Condor Ferries, Red Funnel and Brittany Ferries whilst our sister company the Wight Shipyard Co goes from strength-to-strength in the new build sector. John Webb, SMS’s Technical Manager for the refit, added: “Our senior team, including Nick Jalie and myself, have been docking vessels in Cherbourg for the best part of 15 years now. SMS have the ‘knowhow’ and ‘experience’. “This particular programme of works benefited from the scheduled removal of the vessel from service. 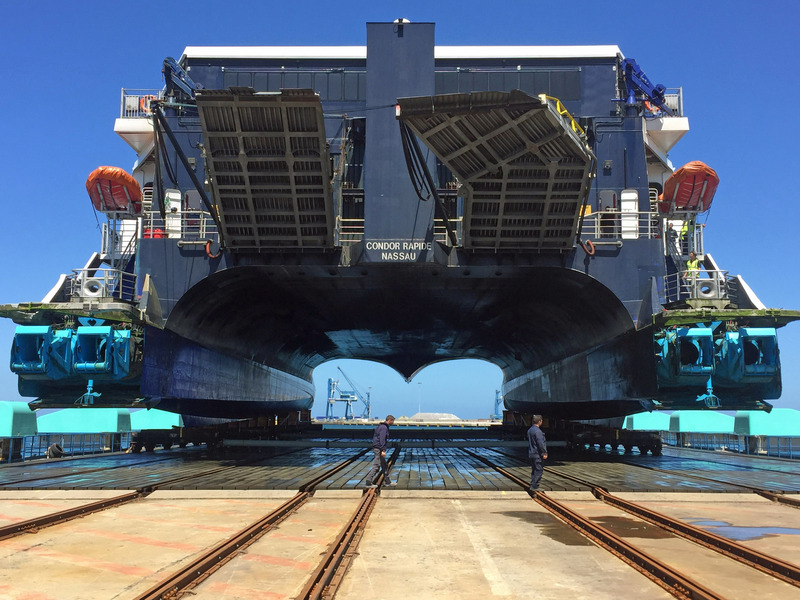 “Works were then undertaken on the Wartsila waterjet propulsion system on the port outer main engine (POME), minor structural repairs and planned electrical upgrades. “Whilst the refit cycle was challenging time wise we returned the ship to her owners on schedule”. In conclusion Rob Loder, Ship Manager for Condor Ferries, said: “As Condor Ferries we were impressed with both the speed and quality of SMS’s works and their co-ordination on the ground in Cherbourg. SMS has a partnership agreement which allows them to use the Syncrolift facility at the Port of Cherbourg on a ‘turn up and go’ basis. SMS have no permanent base in Cherbourg – the company is built around mobility, flexibility and a dynamic multi-skilled workforce that routinely travel. Hence refits and repairs alongside nationally, and now internationally, are considered the norm.